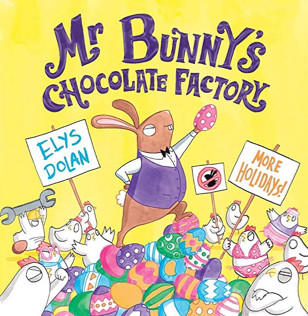 Mr. Bunny runs a factory which makes chocolate eggs. It is staffed by chickens who are fed chocolate so that the eggs they lay are made of chocolate too! The process is described in detail, but all is not well at the factory because Mr Bunny is not a good employer. He is keen to improve his profits by increasing production which means conditions for the workers get even worse. In the end the chickens go on strike and Mr Bunny discovers the error of his ways when he finds trying to manage without his workers is not an easy prospect. This is an amusing story which won the 2019 LOLLIES award (laugh out loud picture book prize) . Written in comic book format with lots of visual jokes this story is great fun and an interesting opportunity to discuss workers’ rights and the idea of protest with your child. Before starting to share the book talk about the question on the title page together – how does your child think chocolate eggs are made? Read the story aloud to your child – starting with the narration on each page and then the speech bubbles – you might like to point these out as you read them. This book would be great fun to read together when you return to it. You could share the reading of the speech bubbles, or one of you could be the narrator and the other could read the chicken’s or Mr Bunny’s words. Share what you both liked about the book – this might be to do with the story or the illustrations. Talk about how the workers in Mr Bunny’s factory feel in the middle of the story when he wants them to work harder and at the end. What would your child have liked to say to Mr Bunny when he wanted the chickens to work harder? Talk about anything that puzzles children for example unfamiliar words or phrases such as ‘crank chocolate production up to the max’, ‘quota’ or ‘poultry’. Act out an imaginary conversation between Mr Bunny and one of his workers together complaining about conditions in the factory and making demands. Your child could write a letter to Mr Bunny to complain about the way he is treating his workers or make a list of demands for better treatment. Make a protest banner. Your child could use a large sheet of card and stick it onto a wooden baton. What will they choose as a slogan? Children could design a chocolate bunny producing machine, drawing their ideas on paper or making a junk model. Watch this film at the Cadbury factory in Bourneville to find out how chocolate eggs are really made. Find out how long it takes to melt chocolate on a hot day or by heating in a pan.